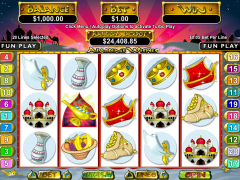 Aladdin wishes is an online casino slot game created by the RNG software providers for online casino games and like they always do, they made this particular game a sensation and a favorite for most casino players. It is widely accepted by both professional and novice players. It is a slot game created with precision since it has an excellent design and supports a beautiful Arabian fairy tales theme. It is a game to reckon since it has wild symbols and scatter symbols that will give you even more chances to win big prizes and bonuses as you enjoy your game. There is also the multiplier option where you could multiply your winnings thus even getting more on your winnings. There are also free spins available once you hit the specified symbols and these are very useful since you will be trying out your luck for free without spending any of your coin. As if that is not enough, there is the progressive jackpot which could make you $10,000 richer once you hit it. The symbols available in this particular game include the genie, Magic lamp, Aladdin, palace, Tataghan, monkey, princess, and sack with coins, magic carpet, fruit, crown and jug. The special symbols that could make you an instant winner are the Aladdin which represents the wild symbol; magic lamp represents the scatter symbol and the Aladdin wishes feature which gives you a bonus round. This game is based on an Arabian theme and has a 20 line, 5 reel design. It is a video slot that offers multiple gaming options like multiplier and progressive jackpots that keeps the player entertained and also rich. This game allows players to wager a maximum of 100 dollars per spin. It supports various currencies and denominations and also multi-line video slot that offer a max of 25 free spins and also a multiplier of 100x. The random jackpot of $10000 is the most amazing feature of this game. It is a favorite for both penny slot and high rollers. To play activate the playlines by selecting the amount you will play per game after entering the stipulated amount to the machine. You could then individually spin the reels and search for your luck. You could hit the wild symbol, Aladdin, and it would replace all other symbols to give you a winning combination with the exception where there is a scatter symbol. However, it would not activate the bonus feature after it has replaced the symbols. It could replace the symbols and activate the jackpot however. It will only appear on reels 2, 3 and 4. You could also hit the scatter symbol, magic lamp, which could appear anywhere on the reels to trigger an entry. Hitting two or more scatter symbols anywhere on the reels will give you a multiplier of 2x for a winning combination. Hitting 3 or more will automatically trigger the bonus round- Aladdin wishes feature. Here you will be taken to a treasure and select one of the 5 lamps displayed to you. This will award you a max of 25 spins while some will offer multipliers of 2x to 100x. The random progressive jackpot is triggered anytime during gameplay irrespective whether you are playing on a max bet or a min one. It can be triggered on any winning combination you achieve. There are several jackpots you could hit with the highest being that one of $10000 and it is triggered by hitting 4 princess symbol with 1 Aladdin symbol. There is also the top fixed jackpot of $5000 activated by hitting 4 genie symbols with 1 Aladdin symbol. There is the top fixed jackpot of 2000 credits and it is triggered by hitting 5 princess symbols or 4 genie symbols. You could also be part of the luck and get to make your wishes by registering for free in any online casino that supports this game. It is not only exciting but its bonuses are ones to go out for.